Supergirl is on her way to CW, and she will become a part of the DC Comics lineup on the network. This now opens the door for an even bigger crossover event next season. This comes from Mark Pedowitz. According to Entertainment Weekly, he revealed that fans of the DC world on television will see all four CW shows combine for one huge crossover event in December. Supergirl will join The Flash, Arrow, and DC’s Legend of Tomorrow for the event. Pedowitz called the planned crossovers its “biggest ever.” He also said that Supergirl should have always been on CW and not CBS. 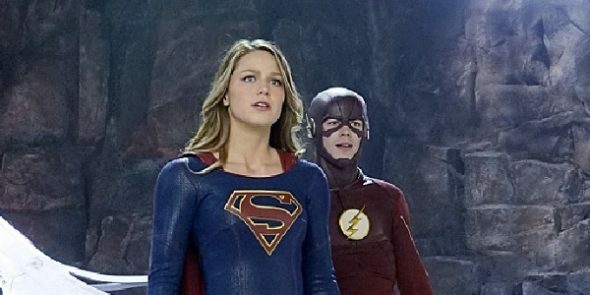 The first season of the series aired on CBS, and it did feature a crossover between The Flash and Supergirl. That crossover event gave Supergirl a big boost in the ratings that night. CW released its first Supergirl teaser earlier this week. Are you excited for this huge crossover later this year? Tell us what you think. More about: Arrow, Arrow: canceled or renewed?, DC's Legends of Tomorrow, DC's Legends of Tomorrow: canceled or renewed?, Supergirl, Supergirl: canceled or renewed?, The Flash (2014), The Flash (2014): canceled or renewed? I think they need to some how add a Supergirl character to Legends of Tomorrow. And how will the crossover effect all the shows to where Supergirl needs to fly over to the Flash’s and Arrow’s earth? I watch Arrow & The Flash & hate crossovers. May stop watching altogether.